Literally moments before I left work on Friday, ready to begin the half-term break, I was sat talking to my friend and colleague Greg Hodgson about literacy. I’ve just put a project together for gifted and talented Year 11 students where they will blog for ten weeks developing their writing skills. The project will encompass in-class and online workshops; seminars; tutorials and support from a professional editor and professional copy-writer. Greg and I discussed the merits of getting all students at our school blogging and how it could impact on improving literacy. What occurred to me during our conversation was that neither of us differentiate between what many refer to as traditional literacy and digital literacy. I don’t like the term digital literacy, never have, as it immediately suggests that understanding digital or media based texts is somehow different to understanding non-digital (analog) texts. The problem is that I don’t believe that. So, here’s an idea: Let’s stop talking about digital literacy and just discuss literacy after all the two are synonymous are they not? Films, Advertising, Websites, Blogs and Video Games all have narratives and codes that need to be understood; they all offer various meanings and representations ready to be interpreted; and they are all part of a person’s life narrative, so why on should they not be valued in the same way that Literature and Art are valued. And why are we not making sure that our children approach all texts (digital or analog) with an equal level of respect and criticism? It’s time to ditch the prejudices; it’s time to stop talking about digital literacy as if it is something different to literacy. We shouldn’t spend time debating what digital literacy is, we should be asking why teach literacy at all? Teaching literacy is not only about getting kids to read books, it’s about teaching our children to read signs, to decipher meaning out of symbols. When those symbols and signs are communicated by road signs we value their purpose encouraging them to get driving lessons and pass their driving test. When those symbols and signs are communicated through a YouTube video or a Video Game we do not seem to value them at all. Surely, if our children are going to be able to survive in this ‘uncertain future’ that lies before them they need to be literate. And not just literate in that they can read words but that they can decipher all texts placed in front of them, analog or digital. The age of the social network, of online collaboration, of information at your finger tips is not some distant notion, it is the state in which we live now and future generations are being born into. The army is using Video Game technology to train its soldiers. Why are we all not using this technology to help prepare our children for their futures? We have a responsibility to make sure that they are literate; with the skills to understand the messages and values that are sewn up in the plethora of texts that they consume on a daily basis. 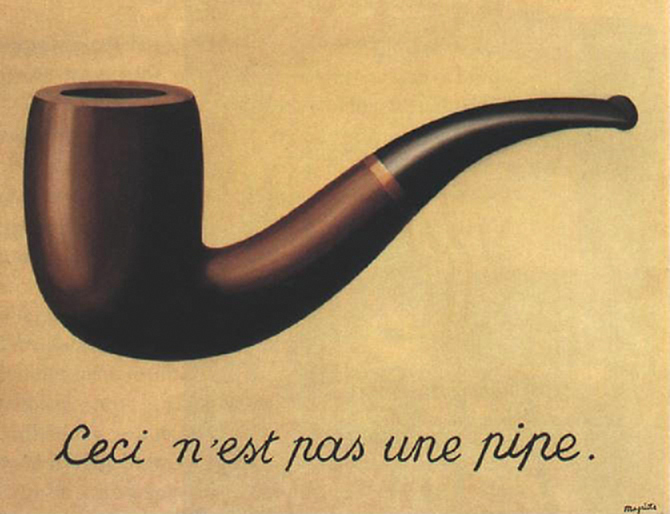 We only have to look to René Magritte’s painting ‘The Treachery of Images‘ [1928-29] to see that this argument has existed for 40 years, before video games grabbed our attention and 60 years before Tim Berners-Lee invented the World Wide Web. Magritte illustrates the duality that all texts, whether made up of words or images, pose for us. In his painting Magritte is commenting on the process of signification; the basis of communication in that all images have more than a single layer of meaning by their very nature; that all texts offer representations and therefore are open to interpretation. This (IMO) is the fundamental reason that literacy should be at the heart of any school curriculum and is the basis for my belief that separating literacies into “analog” and “digital” is actually a banality that should be avoided. It does not matter what the text is, what matters is that we have the skills to be able to understand it. We can look to more recent theorists to see that the purpose and need for literacy is only increasing. As our world has become more and more saturated by modern media, only expedited by the rapid development of the World Wide Web, theorists have been warning of a need to be more literate no matter what form the text takes. Dominic Strinati in ‘An Introduction to the theories of popular culture‘ , states: “The mass media…were once thought of as holding up a mirror to, and thereby reflecting, a wider social reality. Now that reality is only definable in terms of surface reflection of the mirror.” Strinati is suggesting that the way in which we understand our world is through the media that we consume. This raises an important consideration, particularly for teachers. If as Strinati suggests that reality is born out of the mirror then we surely have a responsibility to help our students understand the mirror, whether it’s a magazine article, TV news segment or web page. Jean Baudrillard, ten years earlier, in is his book ‘Simulacra and Simulation‘ , sets out an even deeper fundamental reason that we should teach young people to be critical and question their perceived reality. Baudrillard suggests that modern culture/society is made up from both simulations (copies of real places and things) that become real through perception and simulacra (copies without an original). For example, the film Jurassic Park, presents through CGI and animatronics a highly convincing simulation of dinosaurs which we as the audience accept even though we have never seen a real live dinosaur. We accept the copy (simulacra) as reality although there is no original for it to have been copied from. If simulated Media form our reality then we must ensure that young people are equipped to recognise this and question the texts from which they are forming their understanding. What if dinosaurs bore no resemblance to their CGI counterparts? For many the film will have become a key source in their understanding of the dinosaur, yet it is a lie, a false creation, a guess? Is it acceptable to allow prejudice to continue? Literature and Art are valued and therefore worthy of study and criticism. Should films and websites not be valued in the same way and come under the same level of scrutiny? The death of Media Studies? What’s more, all forms of media require us to read, perceive and be critical and we can encounter them at any time and within any subject. Just as it should not fall to ‘English teachers’ to be the soul authority when it comes to reading Shakespeare and writing stories why should it be that ‘Media Studies teachers’ are expected to be the soul authorities when it comes to understanding Films, Video Games and the World Wide Web? If the answer to this means the death of Media Studies as a distinct subject then so be it as the study of “the Media” ought not be separate from the study of Literature, Science, History, Religion or Philosophy, as the texts that make up a Media Studies curriculum all have a place in any and all of the other subjects found within the school curriculum. Literate: to have the ability to understand, criticise, and (re)create any text, analog or digital. Excellent post James. I believe the new Scottish Curriculum for Excellence goes some way towards recognising your core argument in that it re-defines both Literacy and ‘text’. As a former secondary English teacher I also happen to believe, for the same reasons, that having a discrete subject called ‘English’ as opposed to ‘English Language’ or ‘English Literature’ is outdated. This is something which may only apply to Scotland of course. I think you have hit the nail on the head and this certainly does not only apply to Scotland. I would love to see a curriculum built around literacies rather than discreet subjects. I know that some feel that tweaking the curriculum we have is enough but I think we need to close the book on it and open up a new one rather than simply adding more pages. With a blank page I feel we would be free to ask the big question that Andy Stew and Doug Belshaw have been doing with #purposed: What is the purpose of education? I think the resulting answer would not fit neatly into a curriculum of subjects but it would fit in with my definition of being literate. If we are to prepare young people for their futures, we must be prepared to accept that a curriculum that continues to teach material that may have no intrinsic value to that future, falls short. What is needed is a curriculum that organically responds to the shifting and evolving needs of new generations. I don’t believe a set of defined subjects can provide this. And I think the current school curriculum does more harm than good when it comes to developing the literacy of the young people who encounter it. The recent proposal for the teaching and inclusion of non-words in KS2 tests being a case in point. When I was doing my PGCE we had a couple of guys come down from a college in Leicestershire whose basic premise was that, not only was ‘Twinkle’ (the girls’ magazine) as valid an object of study as Shakespeare, but was no less valuable in itself, as our categories of value are in themselves merely socially conditioned. I am absolutely in favour of developing critical skills – a broad literacy – that can deal with any kind of text (or indeed any kind of cultural product). But I do think that in arguing for media products to be studied alongside literature we need to be careful not to suggest that they are all of equal value. I don’t think you were trying to imply that, but I think we need to be careful not to make literacy (however we define it) a narrowly functional ability (or rather, we should be prepared to see it as functioning more broadly, perhaps). Would you be prepared to allow ‘evaluate’ or even ‘appreciate’ into your 21st Century definition of ‘literate’? No in fact I was aiming for the opposite of “narrow” and trying to say that literacy is and should be the broadest of abilities. To me literacy is the fundamental building block upon which all learning is predicated. As to my definition of literacy, I use the word “criticise” in its broadest sense, in that students should be taught to be ‘critical’ of a text appreciating, analysing and evaluating its meaning, intent and worth. I agree that, just as e-learning should simply be ‘learning, so we should dispense with putting ‘digital’ in front of literacy. And yet… if we neglect to use the Hegelian dialectic of thesis, antithesis, synthesis then we don’t flag up that it’s *not* just ‘business as usual’ when it comes to being literate in a digital world. It’s a difficult tension and one that I’m struggling to fit into 60,000 words! If we are to take Hegelian’s dialectic literally though and use the terms: Abstract-Negative-Concrete then it could be to suggest that “Literacy” is still in the abstract or negative. If that is the case then it is arguably even more important that literacy be at the forefront of the educational agenda as it needs to be explored and developed to reach a more concrete stage. The problem is that to most people literacy as a term is neither in the abstract or negative. Most people believe it to be concrete as their understanding of literacy is definite. This is because the terms ‘reading’ and ‘text’ are narrowly defined/understood by most people. What most academics know and some bodies/countries are beginning to acknowledge more and more is that both ‘reading’ and ‘text’ need to be redefined and in turn so does ‘literacy’. The challenge is to get that redefinition accepted by the populous. Literacy is literacy, it’s definition does not have to change and is therefore (according to Hegelian) concrete. However, reading does not mean recognising letters on a page and text does not mean books. If this was understood and accepted by the mass rather than a niche then perhaps there would be little debate over the meaning of digital literacy, new literacies and so on. @jamesmichie +I’ve literacy piece. Def – I would add repurpose – we do a fair amount of mashing / using 4 a new or different purpose? Thoughts. True, although has that not always been the case. Films have been repackaged but essentially the literacy remains the same. Perhaps new terms are added but the skills of literacy remain fairly consistent. Provocative post, thanks, and I like especially Doug Belshaw’s argument that instead of “e-learning” we are better of talking about learning: ditto “digital literacy”: this sent me off to wikipedia, http://en.wikipedia.org/wiki/Literacy, and where read for the most part a social history, beginning with the special advantage of literacy, in 12th century England, qualifying you for religious instead of secular courts and so greater chances of avoiding being executed by hanging, and so forth. I absolutely agree with your basic point. A most thought-provoking post. The Jurassic Park CGI dinosaurs emerged from decades of palaentological discoveries, research and comparative morphology. Of course, they were based on highly educated guesswork (particularly when simulating their behaviour), but I would assert that the CGI version of dinosaurs in Jurassic Park or Walking with Dinosaurs represent a better fit to the ‘originals’ than the imagined dinosaurs that existed in most of our non-specialist minds. Where does the dividing line between simulacra and simulation lie? It’s a continuum isn’t it? All works of literacy (digital or otherwise) are based on a set of biases, preconceptions and assumptions about what ‘reality’ is. True but because there is even the shadow of a doubt over what ‘reality’ is it only serves to strengthen the case of a wider and deeper understanding of what literacy means in the 21st century. In a media-saturated society it is imperative that people are helped to develop the critical skills to be able to unpack and understand their own unique reality, to the extent which they can take control of how that reality is shaped. Very true. I think we’re all guilty sometimes of seeing ourselves as gatekeepers of the truth/reality. That’s the Victorian legacy still hanging on in there, and is tough for many teachers to abandon. Instead we should be helping students to navigate a world of evidence, probability, uncertainty and opinion. Next Next post: Redesigning jamesmichie.com(blog) – CSS FTW!